Last Sunday I preached on the intersections of hope and gratitude, how those two always combine to create a generous life. I ended the sermon by handing out DIY Advent calendars. This consisted of a blank December calendar page and a list of Random Acts of Kindness with the suggestion to put one in each day of December. I said you could tailor it to your beliefs or schedule. If you wanted it to be like a traditional Advent calendar, it would end on Christmas Eve, or you could end it on December 21st, in celebration of the Solstice, or do just the eight days of Hanukkah, beginning on December 16th, or the week of Kwanza beginning on December 26, or the whole month of December! Why not?? I got this idea from a face book friend, who in turn scooped it from the website http://www.coffeecupsandcrayons.com/. Here’s the link if you missed the service. On this website, there are actions listed in each date, so you can just use that or print your own blank December calendar and fill in what you uniquely want to do (in good ole UU fashion!) The main thing is to just do something that fosters kindness and gratitude and hope in this season. There has been a lot of troubling news coming across the airwaves in recent weeks and it can be easy to feel cynical or downright despairing regarding the strange species of humanity. This Advent Calendar of Kindness is a way to dispel the negativity and instead seek to instill beauty and wonder. In this season of Joy to the world, why should we not be the Joy that advent awaits? Why should we not be the holy one come to bring wholeness to our world? Why should we not be the bright star in the sky that leads those who seek to miracles of justice and hope and love? 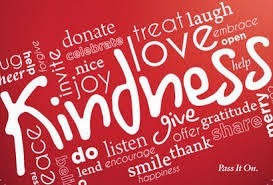 I filled out my calendar with my RAKs (Random Acts of Kindness) on Sunday night. I confess, I used some more than once. I liked the thought of leaving a happy note or kindness stone for someone to find and decided I would do that for more than one person. I haven’t candy-caned a parking lot yet, but it’s on my list! What I like about this practice is the intentionality of these random acts of kindness. On Monday, my day off, I normally like to lie low and not leave the house, but I realized I had put offer my place to someone in line for that day, so got dressed, went to the store to buy some non-essential items, all so I could say to the person in line behind, "you go ahead of me." The smile on that man’s face was priceless, particularly in this season of shopping madness where people come to fisticuffs over the last blue sweater on sale. Today, I am donating books I no longer need to our new outdoor mini lending library. I have chosen only a couple, as per the instructions of the mini library team, but am setting aside others to donate as these books disappear. 1. Give up your spot in line. 2. Donate money to an organization you participate in. 3. Pay for someone else’s coffee. 4. Send cards to service men and women. 5. Tell jokes to make someone smile. 6. Donate food to your food bank. 7. Donate pet supplies to the shelter. 8. Help someone do a chore or other job. 9. Do yard work or shovel for a neighbor. 10. Donate books you no longer need. 14. Donate toys to a children’s hospital. 15. Donate a pair of new pajamas for kids in a shelter. 16. Make get well cards for someone who needs them. 17. Bring coffee to your teachers. 18. Make holiday decorations for others. 19. Make ornaments for your neighbors. 20. Donate new toys to Toys for Tots. 22. Candy cane bomb a parking lot. Let’s make a conscious effort to do random acts of kindness in these holiday times so that we might indeed bring joy to the world!